Congratulations, you’re getting married! Now it’s time to start planning your dream wedding. One of the most significant parts of planning the big day is designing a venue that you and your guests will remember forever. There are so many details to attend to when it comes to choosing the décor, dining and location for your special event. Read on in today’s blog from The Alleen Company to discover some key ways to make your venue magical and memorable! If your wedding day will take place during a time of year when the weather is beautiful, an outdoor wedding event is a marvelous idea! It allows you and your guests to enjoy the beauty of a natural setting as you celebrate the love you and your partner share. However, choosing an outdoor wedding means you will need to do a little extra planning to handle any unexpected weather. Let The Alleen Company provide the perfect tent enclosure for your event, so you can enjoy the natural beauty of the outdoors while still providing protection from the elements for you and your guests. Renting a tent is the perfect way to create an outdoor space with all the comforts of indoor design. Our tent enclosures are spacious, light and beautiful. Your guests will love the setting for your special day, and so will you! At The Alleen Company, we have a variety of exceptional tents for you to choose from for your event! 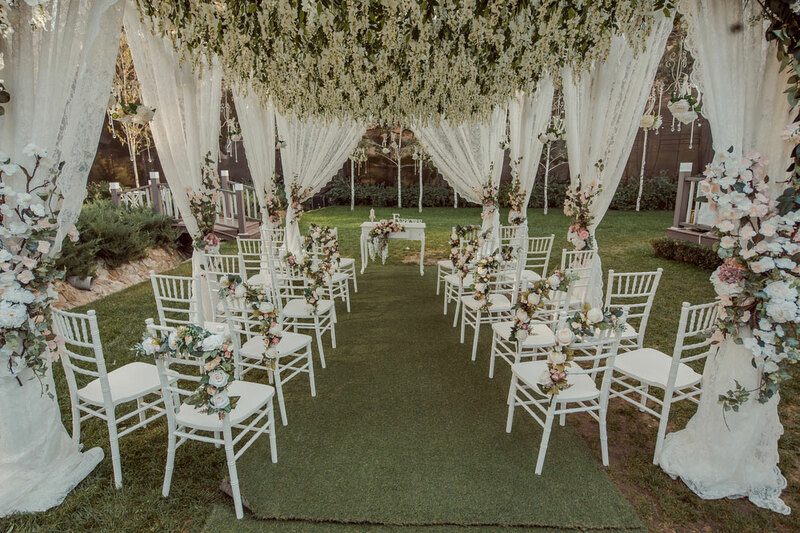 Whether you have your event inside or outside, creating comfortable and unique seating spaces for your guests is an excellent way to make your wedding venue memorable. Of course, every event will have tables and chairs where guests sit during dinner. However, going an extra step and creating a separate lounge area where guests can relax and spend time together is a unique idea that will delight your guests. At The Alleen Company, we have some exciting options for lounge areas. We offer couches, comfy chairs, and side tables where guests can lounge comfortably and sip on refreshments. Create the perfect mood with your choice of romantic lighting options for your wedding venue! Delight your guests with the soft glow of bistro lighting, or turn up the wow factor with a decadent crystal chandelier. Browse our rental catalog and find something that works for the mood you hope to set at your reception! No wedding venue is complete without a dance floor! Nothing is more memorable than dancing the night away underneath the glow of romantic lighting with friends and family. At The Alleen Company, we have several different options for dance floors. Feel free to browse through our rental catalog and see what we have to offer! If you’re looking for a rental company with everything you need to create the perfect wedding venue, then look no further than The Alleen Company. We offer everything from tents to lighting, from dining furniture to dance floors! Make sure to check out our rental catalog! We would be thrilled to help you create a unique and beautiful venue that you will always remember. Contact The Alleen Company today to find out what we can do for you!